Velosewer of How good is that? mentioned that she had a 24 hour layover in LAX in June and asked if it would be possible to fit in some fabric shopping. We made plans to meet up, but they went awry. Fortunately, we still managed to hit SAS Fabrics near the airport and meet up later for dinner with our respective spouses before they crashed with jet lag. FWIW, I think that fabric shopping is a great way to get over jet lag. It's stimulating enough to keep one awake, and mistakes made due to fatigue can be quickly ditched before you get on the home-bound plane. Velosewer is wearing her me-made !purple! jeans that I covet so much, and cardi-wrap. I wore the outfit from Fail to win! 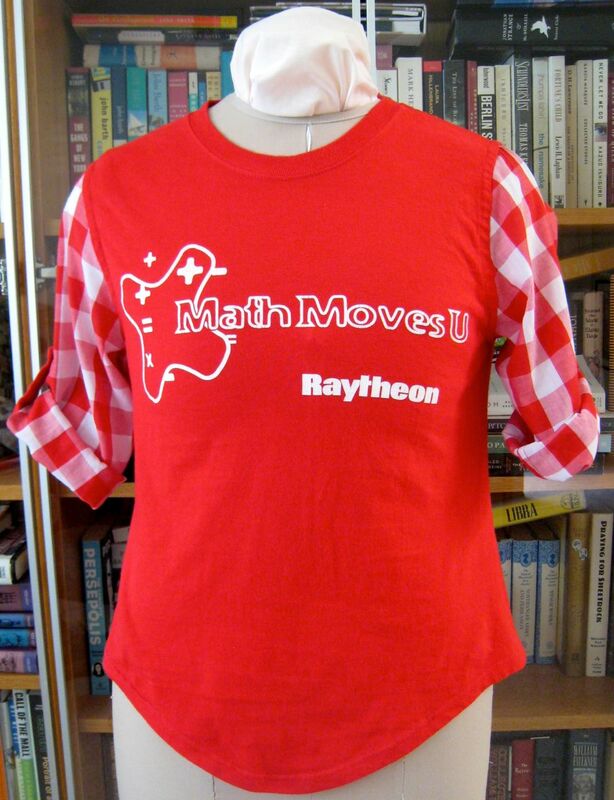 I even bought the fabric from SAS. I forgot my camera so these photos are courtesy of velosewer, who used the same photos in her post. One possible reason why SAS does not allow photography is that they are an odd-jobber that sometimes sells high end and designer fabrics at very low prices. Those designers might not be happy to see their old stock photographed in settings that they can't control. It's all good, because you will find gold interspersed with dross in this jam-packed store. In the photo below, I'm stroking silk tweed for $10/yard. If you want to make a silk tweed Chanel-style jacket, select one of the $3/yard silk charmeuses (see how Trena used hers) on the other side of the doorway in a coordinating color. They also received a shipment of 50/50 Merino wool (ultra-smooth Australian 120s)/polyester blend suitings in subtly textured basic colors like black, navy, tan and gray for $10/yd. It's June and I've just finished sewing up the pieces I selected when I met up with Rose there in March. Shopping with other sewists is illuminating; they pick stuff I wouldn't have normally have glanced at. Then I become inspired by how they use it. This could be really bad for my fabric hoarding tendencies--but the company is so much fun. BTW, I am always happy to receive Tim Tams and Easiyo Biolife Yogurt packets from Aussie and Kiwi friends. Update: Internet karma! An Aussie friend I met through our blogs just asked if she could stay with us next month. 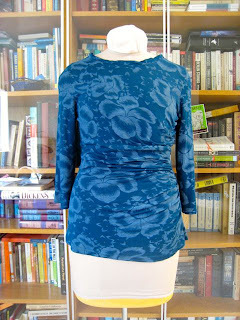 I'm making a wish list of Style Arc patterns and books available in Australia but not (easily) found here. She's visiting LA, SD and SF if you need a pattern mule. I've tried several, but find idiosyncrasies in each one that I don't like. Right now, I find Feedly and The Old Reader the least irritating. TOR is a real shoestring operation and their servers are swamped. Consider sending them a donation so that they can add servers. It looks the most promising (for the way I like to use RSS readers, YMMV). I also signed up for Bloglovin and claimed my blog, but I am not sure I recommend that service. After spending an evening trying all 3 services, none of them do what GR did. Why, oh why, can't they just allow us to pay to use Google Reader instead of canceling it? at the Lair of the Golden Bear, Camp Blue. Mark read when he wasn't hiking. 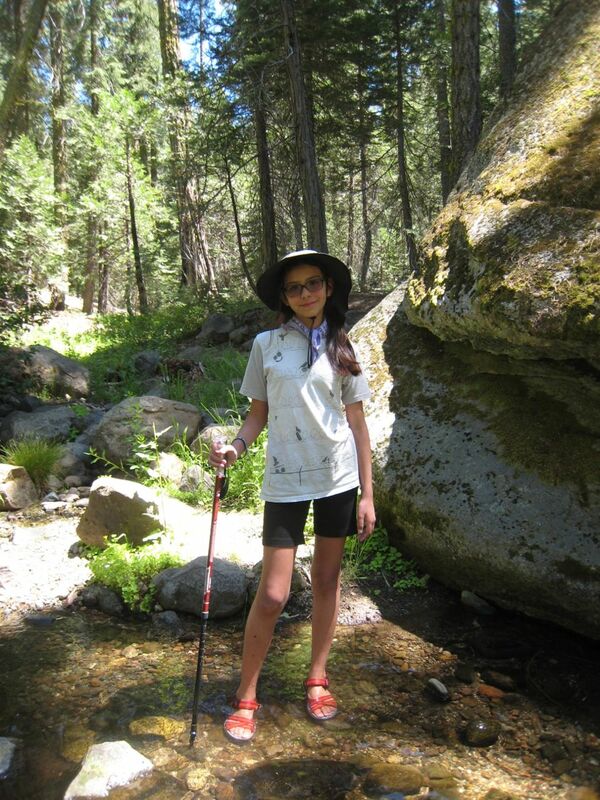 Iris and I cruised the creek when we weren't at the pottery/art grove. We did a little bit of paddle boarding, kayaking and mountain biking. All three of us also read a lot. On the way home, we stopped by the Twain Harte Market to purchase locally-produced wines that we can't find elsewhere. 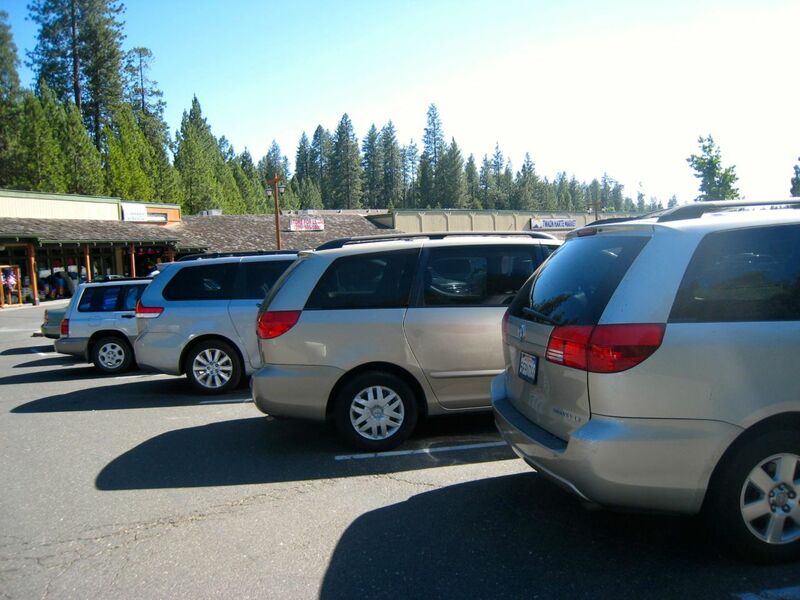 When we got out, we saw two other silver Toyota Sienna minivans parked alongside. That reminds me of this photo of our other car. Regrettably, we missed Ciclavia Iconic Wilshire Boulevard so that we could help Iris get settled into CTY (sleepaway) camp the day after we got home. We got home around 6 PM Saturday, registration for CTY camp was the next morning. I performed a heroic laundry feat to get everything unpacked, washed and repacked. I'm not sure if anyone noticed; no one thanked me. 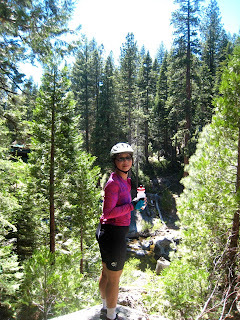 As I previously mentioned, there was just enough rayon/lycra jersey to eke out a top for myself. The most interesting part about Vogue 1020 is the asymmetric side gathers. Don't the pattern pieces remind you of things you might see in the Pattern Magic books? I didn't follow the instructions. I gathered each piece separately and pin-basted them to a strip of silk selvedge. (I save my selvedges for ersatz stay tape.) The pattern piece for the stay measured 12" between the dots. I marked 12" in chalk on the stay, and then pulled the gathering stitches to match. Rather than use the turned under and stitched neckline in the pattern, I tried a twisted collar band with mixed success. This makes me appreciate the evenness of RTW twisted necklines. 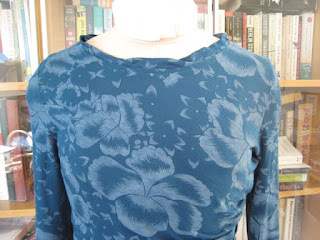 This top needs to be very figure-hugging for the gathers to stay in place. It runs true to size--allowing for 0-1" ease. I cut out a size 12, but took a smaller seam allowance below the waist to give an extra inch around the hips. 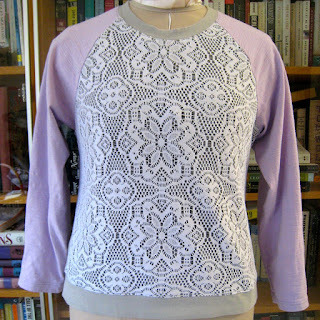 I've also made McCall's 6400, another similar Pattern Magic-like top. That was a fit disaster. I made a size Medium (12-14). 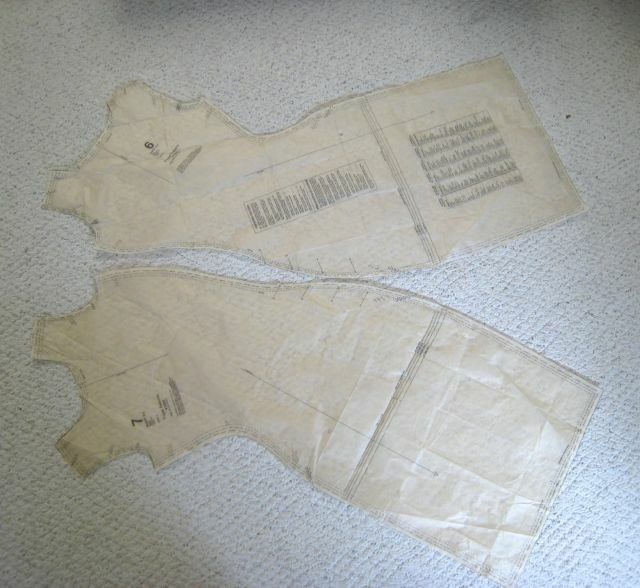 The neck and shoulders were huge; the ease around the hips prevented the side from scrunching up as shown on the pattern envelope. The model must be wearing a top several sizes smaller than her measurements would place her. Vogue 1020 is much better constructed (stays in the seam!) and accurately-sized for the style. Guess which pattern is out of print and which one is still for sale? Sigh. Snap up used copies of Vogue 1020 on the internets before they become rare. 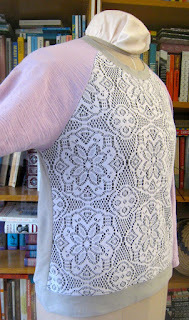 By the time I finished this top, I had only small scraps left. I wonder if I could enter this in the Stash Contest? This piece had been marinating in my fabric collection for several years and I used up all of it. 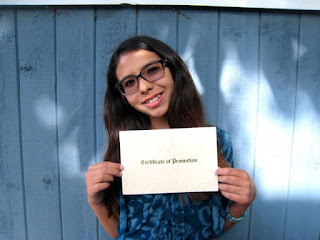 About a month ago, Iris started dropping hints that she wanted a new dress for the promotion ceremony (from middle school to high school). When I made Vogue 1224 for a friend's daughter last summer, Iris said it was a really cute dress and she would like one, too. I pulled out the pattern and we went through my stash until we agreed on this piece. 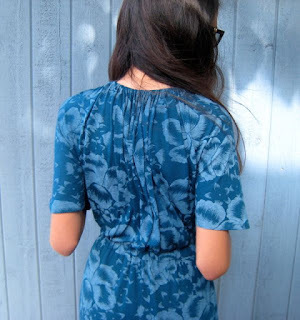 I love the color and the print of this rayon/lycra jersey from SAS Fabrics. It's a bit sheer, but I self-lined the skirt for opacity and added 6" to the hem. I read that the new hem length is just below the knee; Iris is au courant. We moved the hair out of the way to better show the back neckline. I cut a straight size 8, but tightened up the neck elastic to raise the neckline. 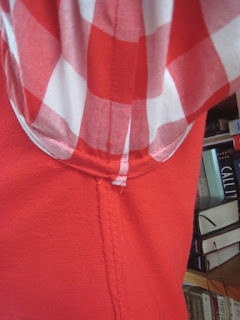 The first time around, I was confused about how to sew the underarm area. The second time around, the instructions made sense. Rather than transfer the markings for the side stitching lines from the pattern, I put the dress on the recipient and marked stitching lines that would give a good fit and side coverage. No gaposis here. New glasses. Notice that the hair poufed up between morning and afternoon. The sleek hair last night right after we came home from the salon. 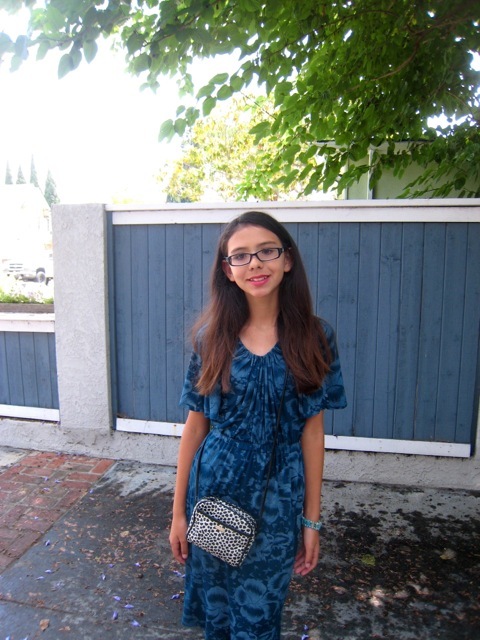 With the high humidity of "June Gloom", we needed to give her hair a light once-over with a flat iron this morning. My skin loves the humidity here. My daughter's hair does not. 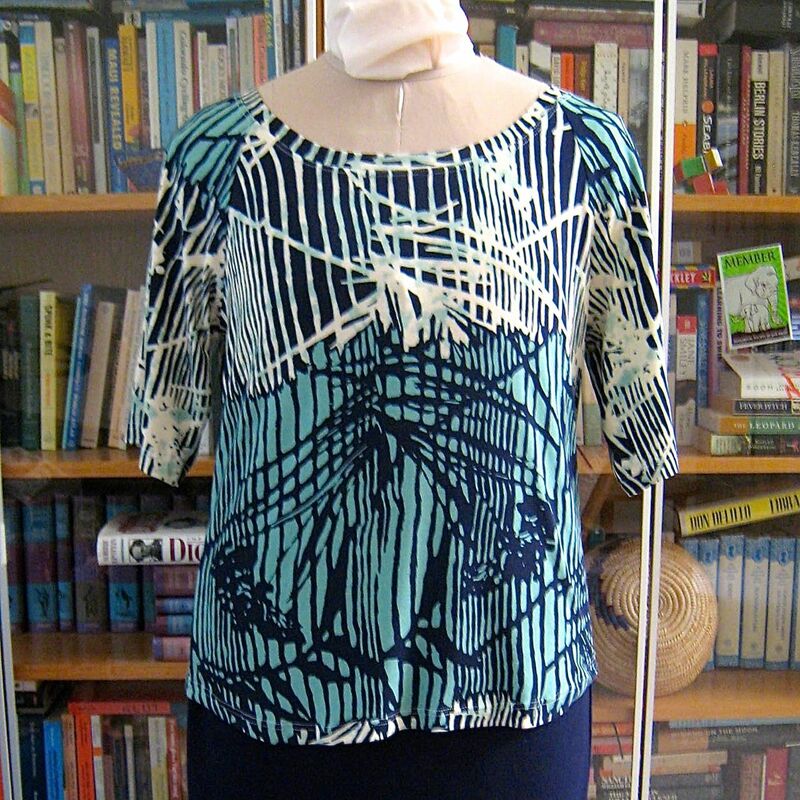 There was enough fabric left over to sew a top for me from Vogue 1020. Stay tuned. If you already have a good sewing machine and are thinking of purchasing a serger, may I recommend reading a few books before making your purchase? This started out as a comment on Petit Main Sauvage, but I think it deserves its own post here. Lauriana used her serger to make a mock-flatlock hem. It's stretchy, sturdy and doesn't require a coverstitch machine or twin needle. I completely forgot about this technique until she mentioned hemming her amazing twist top that way. I first learned this technique from my Bernina dealer* when I bought my Bernette 334DS (made by Juki). She showed me how to do this with 2 or 3 threads. The manual only shows how to do this with 2 threads (lower looper and one needle) and calls it "2 thread flatlock" (page 21). They recommend loosening the needle tension and tightening the lower looper tension. 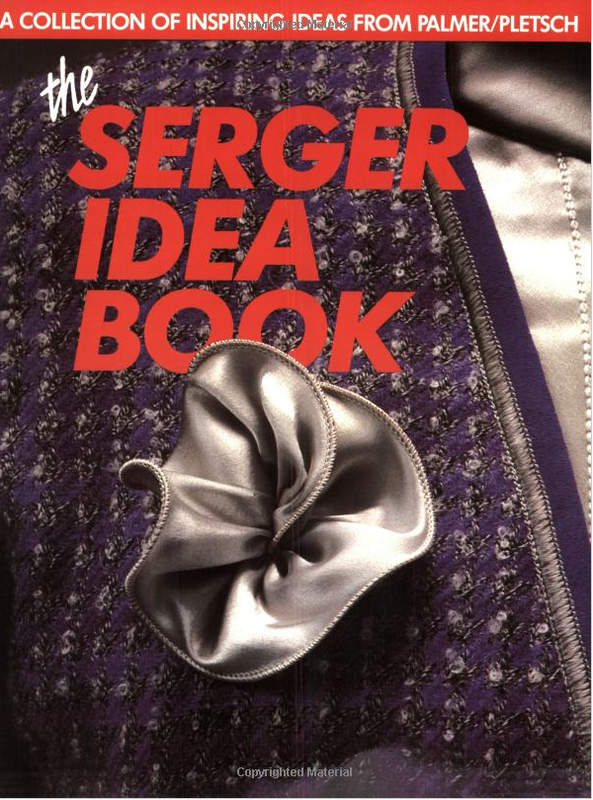 The Serger Idea Book from Palmer/Pletsch shows how to flatlock with either 2 or 3 threads on pages 18-20. They recommend lowering the top thread tension and increasing the lower looper tension as far as possible. It's an old book, but full of useful information. Used copies can be purchased on Amazon for $0.01 + shipping. If you are having trouble with your serger, or are just learning how to use a serger, I highly recommend The Ultimate Serger Answer Guide. It helps you diagnose and solve most serger problems (or refers you to a dealer for more complicated timing ones). Used copies are $1.98 and up. Singer Reference Library Sewing with an Overlock teaches serger-specific sewing techniques. $0.01 + shipping. I expect the updated The New Sewing with a Serger will be just as useful. Serged Garments in Minutes explains serger construction order and techniques. $0.01 used from Amazon. Sew Fast, Faster, Fastest is not serger-specific, but explains different construction techniques and sewing orders. 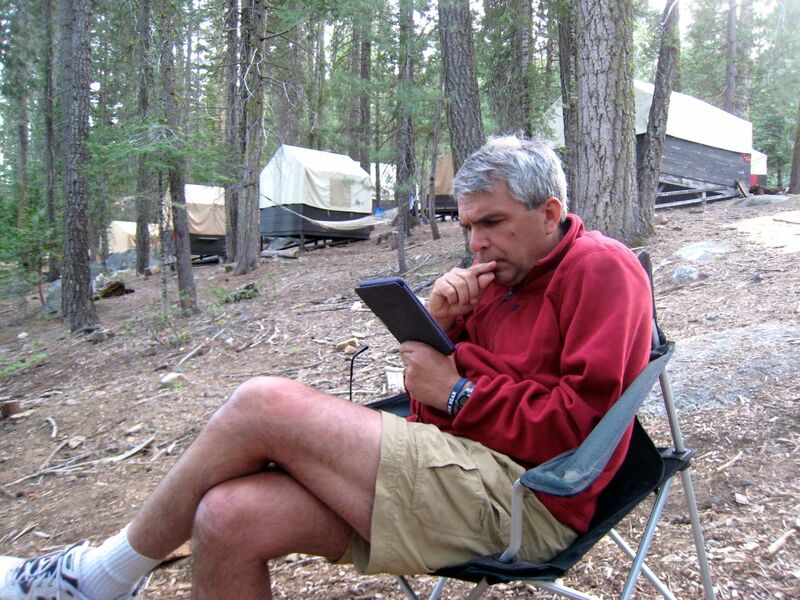 You can see the trade-offs in the name of saving time and decide which level is right for you. 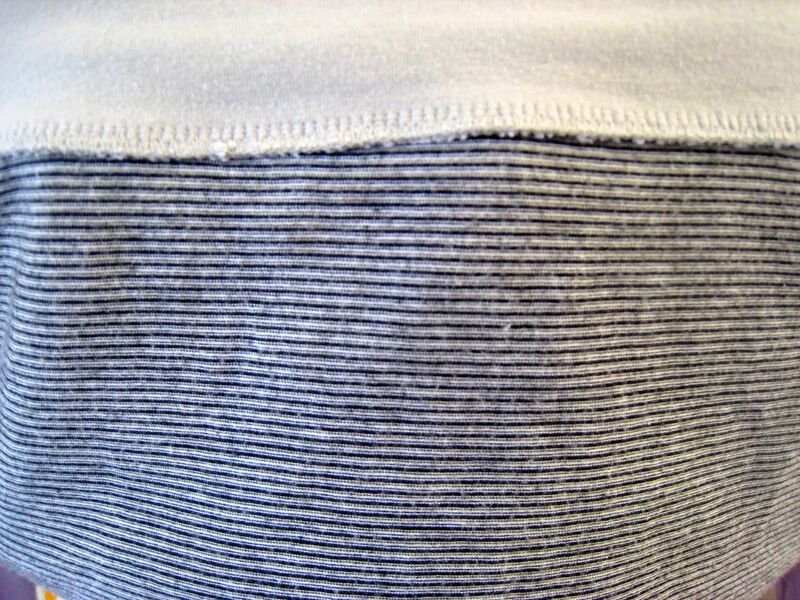 Most cheap clothes are sewn with "fastest" techniques, which means an irritating seam up one shoulder and across the neckband on t-shirts. I would take the extra 2 minutes to use the "faster" (better RTW) or extra 5 minutes to do the "fast" (designer) technique instead. But, you may decide differently. The nice thing about this book is that it doesn't tell you what is right or wrong. it just explains different techniques clearly to give you the knowledge you need to make your own decisions. It's also available used for as little as $0.01 through Amazon. None of these books include the words "new" or "modern" in their titles or show super skinny models wearing painfully hip or "retro" clothes. But, they were written by professional home economists back in the day when home economics was taken so seriously, smart women went to university and earned graduate degrees in home ec. These authors *really* know how to construct clothing and how to teach. Speaking of #oldpeoplearegoodateverything, have you seen Ann Rowley's latest couture jacket on Flickr? She wrote, "This jacket is made almost entirely by hand. It took around 21 hours to make, of which just 34 minutes was spent machine stitching!" Not surprisingly, Ann is a retired home ec teacher. She trounced the "modern" sewers in the Great British Sewing Bee. I took home ec in 8th grade, but my daughter doesn't have the option. That is beyond sad, but I will give that its own post another day. * Yes, Berninas appear to be overpriced relative to competitors. But, keep in mind that the prices include dealer training. You should get 6-24 hours of training in how to use your specific machine in a small group setting (or one on one) with your dealer. When I purchased my Bernina Aurora QE during an illness and forgot everything I learned in class, my dealer let me repeat the classes as a refresher after I recovered without extra charge. You *do* get something of value out of that extra $$$. They can only afford to keep their in-house instructors by paying them like professionals and charging you $$$ to pay their salaries. I made another Kwik Sew 2874 raglan top this year using pieces I found at SAS Fabrics. I really wanted to make a lace overlay shirt, but this was the only piece of soft lace I found after searching. When I got it home, it languished because it resembles a tablecloth. I tried it with a dark underlay and it looked too harsh. I tried it with a light underlay and the pattern was too subtle. 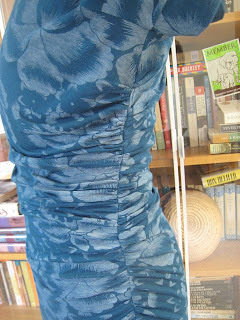 Then I saw this Anthropologie top and realized that a stripe underlay would create an interesting moire effect. I hadn't figured out how to hem the lace or how to handle the weight difference between the double-layered front and the single-layer back. 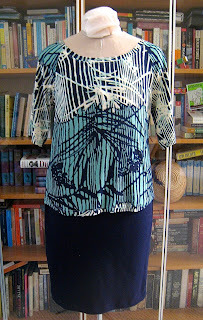 However, the RTW top used a lighter knit for the underlay to balance the weight. 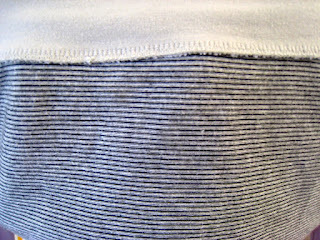 A banded bottom also solves the hem problem. I didn't have enough of the gray knit so I used some lavender. Those pieces are leftover from sewing Iris' baby clothes! I need to be better about getting rid of scraps or else we will drown in them. Does the underlay stripe look familiar? 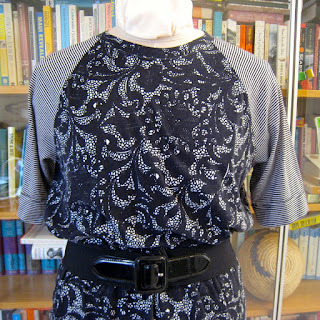 It should, because I used it to make another lace-effect dress last year. To round out the gallery, I'll show again the blue top from the recent set. I used this pattern so frequently, I created a Flickr Kwik Sew 2874 set. In fact, I just discovered that I erroneously referred to this as OOP in 2011. 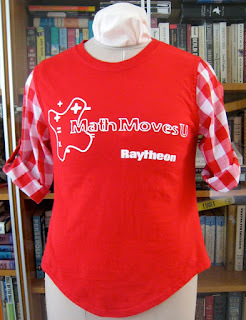 This pattern works for stretch wovens as long as you make a dart in each sleeve piece at the shoulder line and add extra width at the sleeves. Our guest and I did bust out the serger to make this outfit for his girlfriend. He needed to bring home something nice to assuage his guilt for going on a road trip/vacation while she stayed home to work. A remnant I picked up at Fabrix during PR Weekend seemed just her style. 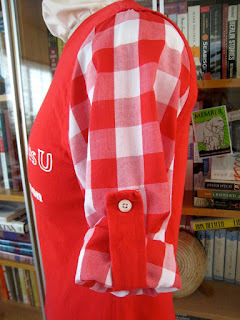 I paired it with Kwik Sew 2874, a basic raglan shirt pattern I have sewn at least 5 times. We used the lower neckline of View C with the shaped hemline of View B and truncated the sleeves to just above the elbow. 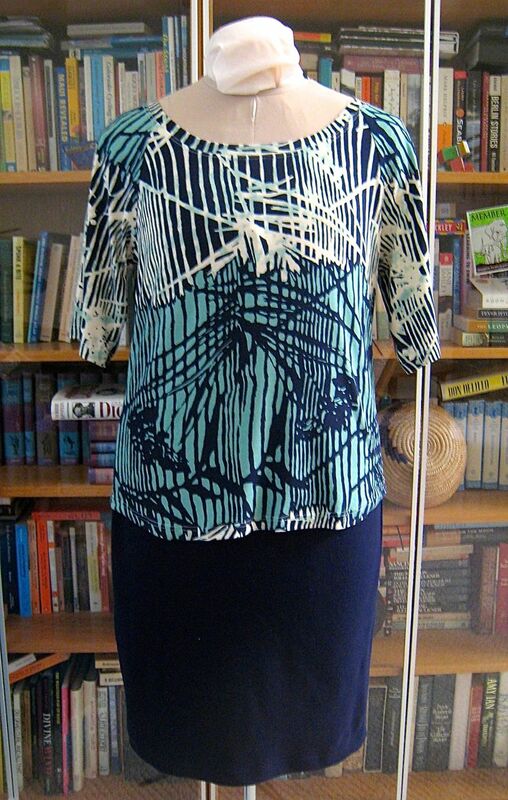 While we were at it, I grabbed another piece from Fabrix, a navy cotton pique knit, and made a shaped pencil skirt using the skirt portion of Vogue 1224. That dress is scandalously short so I lengthened it 5-6" to 23" long to end just above her knees. The skirt pieces are ingeniously shaped to curve around the hips and peg at the hem to exactly the right width to appear perfectly straight. It's like wearing the Parthenon columns (Art History humor). The recipient is unfairly tall and slim with big shoulders, small hips and long legs. I cut the top in size medium and the skirt in size 12. Another gratuitous shot just to show how nicely the two fabrics pair. He says that I made him look like a ridiculously good boyfriend. He's a ridiculously good friend so it was a pleasure to make him look good at home. I tried on the skirt and it fit so nicely (with 0 ease), I made another one for myself. So I did get something out of it. If you are keeping score, I've now sewn four of the pieces I picked up at PR Weekend. The outfit looked vaguely familiar. 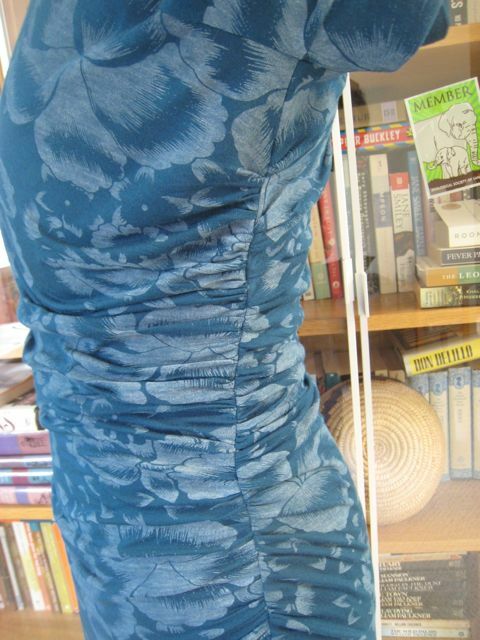 Then I realized that I had previously paired KS2847 and V1224 to Frankenpattern the dress I wore in Unschooling. Myrna may be interested in reading that post that because Iris wore Vogue 8936, a dress that she wants to make. When I was sewing with my friend/houseguest, we discussed equipment and tools. My recommendation to a beginning hobbyist is to buy a good quality sewing machine first. You can sew almost anything you desire on it, as long as you know a few techniques. Save the money you would have spent on both a mediocre sewing machine and a serger and put that into a good sewing machine. Then save up for a good serger. I didn't buy a serger until after I had been sewing seriously for nearly a decade. For example, when I made my refashioned red shirt, I didn't feel like changing the thread in the serger so I made the shirt entirely with my sewing machine. The red tab detail was worth the extra effort. I made the tabs with fabric from one sleeve. 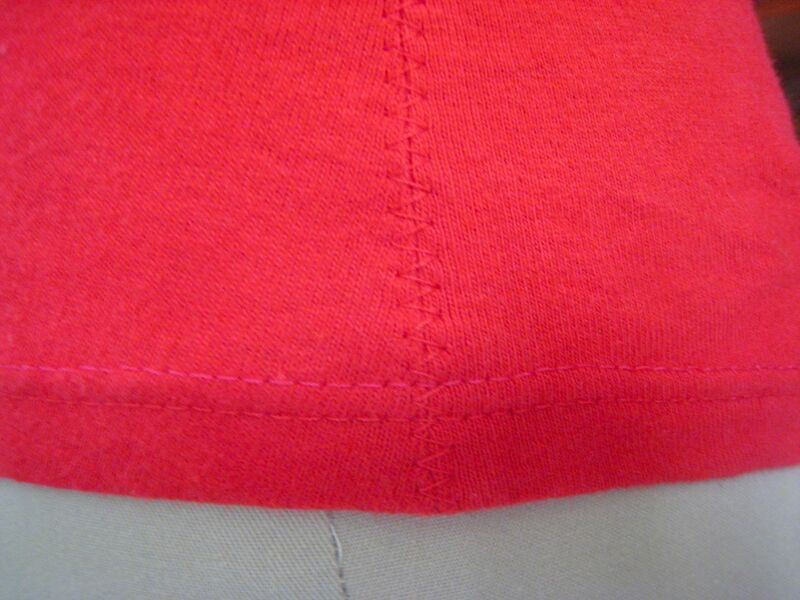 The armhole seam was sewn in the round. 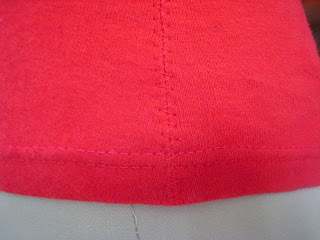 Then the shirt body seam allowance (SA) was trimmed and the sleeve SA folded over and sewn in a flat-fell seam. See how clean it looks on the underside? 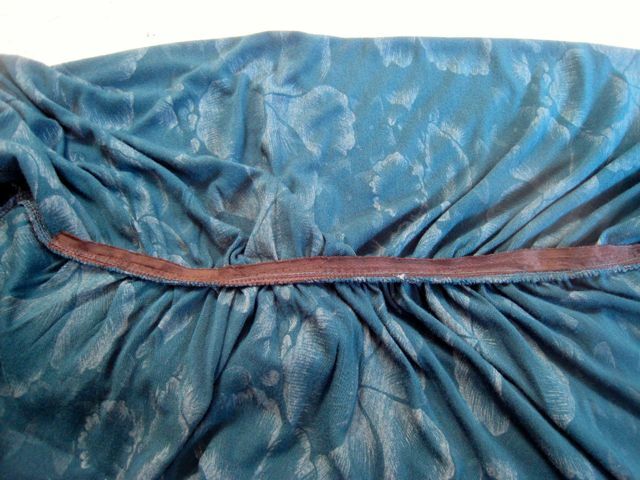 You can see that I sewed the side seams with a narrow zig-zag (0.5 mm), pressed them open, and then used a wide (5.0 mm) zig-zag to hold them open. I used French seams for the sleeve seams in the light-weight woven cotton. Hems were turned under and stitched with a twin needle and the needle thread tension loosened two settings from normal (from 4 to 2 on my machine). Loosen your top needle tension, lengthen the stitch to 2.8-3.0 mm, and you should have no trouble with the dreaded "tunneling" on firm knits. For softer knits, you may need to loosen the top thread further, use a narrower twin needle spacing, or resort to a strip of light fusible tricot or tearaway/dissovable stabilizer. Test on a scrap until you are happy with the results. 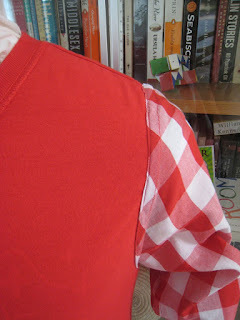 I use and reuse basics such as Kwik Sew 2555, often. This time, I cut a size small instead of the medium in Fashion Fail. Small gives a more fashionable and closer fit, but I think I will grade between the small and medium sizes because I am more comfortable with a looser fit. The medium looked just plain sloppy and awful. 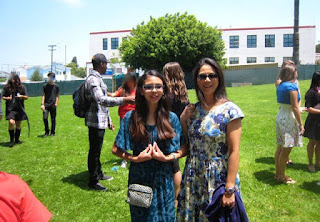 So my daughter's 8th grade class went to the high school they will be attending in the fall for "Field Day". "Field Day" is supposed to serve two purposes: help familiarize 8th graders with the high school and allow kids from both feeder middle schools to meet each other in an informal setting. I suspect that there is a third motive--to allow the athletic coaches to size up the kids for talent and recruit them to try out for sports teams. My kid was assigned to golf, lacrosse and track & field. 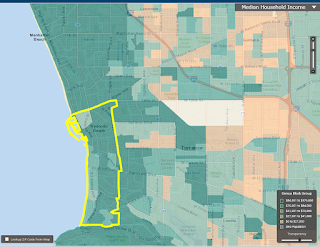 Golf and lacrosse, and the 180 degree ocean views should be a tip off that this is not your typical California neighborhood public school. I asked her how it went. Did she meet anyone interesting? Did she like any of the sports? She said that the kids from the other school spent all day talking about how the kids at her school are so "ghetto". "OMG, did they really say that? ", I asked. "Over and over, although one girl said that wasn't entirely true because 'some of them are white'." I talked to one of the school staff that chaperoned the event to ask if she heard anything similar. She replied that she heard even worse. Kids from the other school came up to kids from our school and said, "We have iPads and you don't." The chaperone mentioned another thing. The kids from our school also observed that the other school must not have a dress code; the skimpy attire on some students from the wealthier school would get a student sent home at their school. If you go by average test scores, the wealthier school would appear to be a superior choice. But, if you stratify by parental educational attainment--a proxy for class--you can see that their is no statistically significant difference in test scores for children of people with graduate educations. However, test scores don't tell you about other things kids learn from school. Zoom out to see the sharp drop off in income as you move east from the coast. It's an informative complement to my hometown analysis. If there were 10 or fewer students in a category, the sample size is considered too small to be significant. However, the entirely predictably erratic performance of 17 students was considered a statistically robust enough result to brand the school a failure and put it in PI status. Anyone familiar with analysis of variance (ANOVA) aka "the statistics of small numbers" knows nothing magical happens between sample sizes of 10 and 11. A smaller sample will almost always show more variance than a larger sample. I think our elected lawmakers should be given standardized tests to assess their critical thinking skills. Their scores should be posted on the internet and also on the ballots.